I've just got my Smart effector hooked up and I wanted to share what I've done so far on the part cooling fan. I've had success in the past using small radial (blower, squirrel-cage, etc) fans and wanted to attach one to the smart effector. Haydn Huntly uses three of them at an angle for some fairly extreme airflow at the expense of build space (http://www.kosselplus.com/). 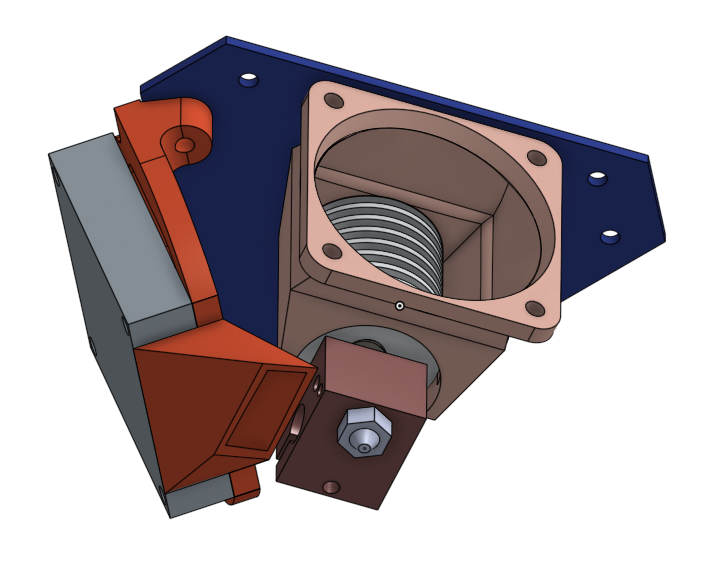 I wanted just a single fan, mounted vertically, with some kind of ducting to get the air to the nozzle tip. What I need to do now is duct the air onto the nozzle. As a quick test, I bent a piece of of plastic (old store card in this case) at a 90 degree angle and glued it onto the fan. This actually works pretty well and a fair amount of cold air is hitting the nozzle. It's far from optimal though and a lot of the airflow is wasted. The challenge is using the tiny amount of vertical space left to channel the air without constricting airflow too much. Has anyone tried cutting into the exit port on one of these fans? I was thinking about chopping a (large) hole in the side nearest the nozzle and closing off most of the original exit. A duct on the side would have more room to work. It's not great for airflow, again, but these fans have that to spare, certainly relative to axial fans. I lack the time anytime soon. I used 2 3010 blowers and don't use a nozzle. I placed them so that they swirl around the nozzle to get max air flow at the tip. I'll throw up a pic tonight. I tried one larger radial, but the flow reduced so much from redirecting it to both sides was dramatic. I have much more airflow now, but the downside is the smaller radial fans are kind of expensive compared to the 5015 ones. Where did you get the radial fans? I have been trying to find a source for a good small fan to use on my delta. I have tried a verity of (part cooling) fans on different machines, my best results have been with high volume low velocity. Here is a couple of pics showing how I have mounted a 40x10 blower fan. That looks perfect. What model number is that fan, if you don't mind me asking, I've not seen a tiny blower fan like that on general sale? Looks good, is there any parts to 3d print to make this work? Also whats the noise like compared to a standard 40mm fan. Edit: The listing for the 12 volt fans on ebay has been discontinued. Search for 40x10 blower fan and you'll find both 12V and 24V. I did have to print some small pieces to attach to the effector and for the nozzle end. Then I just hot glued the fan to both pieces. Away from that computer with the files, but will try to remember to get them up. Also whats the noise like compared to a standard 40mm fan. Missed this earlier. 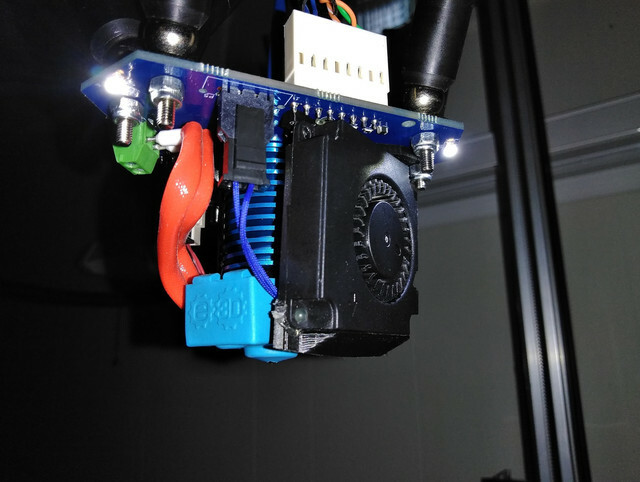 I can't hear it over the 30mm hotend fan. Let me know if this works for getting the files. Thanks! I have issues with one sided air flow, so I will try and make a mount for the other side to give it another fan. I have tried. Just not enough room. But, I am trying to keep both fans vertical and inside the effector. I used 2 4010 radials and no nozzles. I positioned them while running, and found they actually had a very focused, but far off axis flow of air. Due to this I had to have them pretty off axis to get the air in the right spot without going below the nozzle. I have one blowing just across the front side of the nozzle, and one blowing just off the back in the opposite direction, and it has a nice swirling flow of air right at the tip, with no warm spot under the extended side of the heater block. They stick out from the effector slightly. I could get them inside of the effector with 3010's and a nozzle, but I am finding that it doesn't matter, and the fans sticking out don't get in the way. They look really off, but the air flow is pointed directly in front of and behind the nozzle. I might give an aquarium air pump a try if I can find one that will flow enough air to keep the entire area under the block cool. I have seen people plumb a hose into bent copper rings right around the nozzle fed by a pump. I don't remember the name of the design, but it is well known. I don't think I will like that, as I really like the extra air flow that cools the entire area…but I might try it sometime. Berd Air is the one with the copper tubing. My old effector had two of these fans on opposite sides of the hot end. With the same type of nozzle I have on now, it did just that. Created a swirl pattern around the tip. 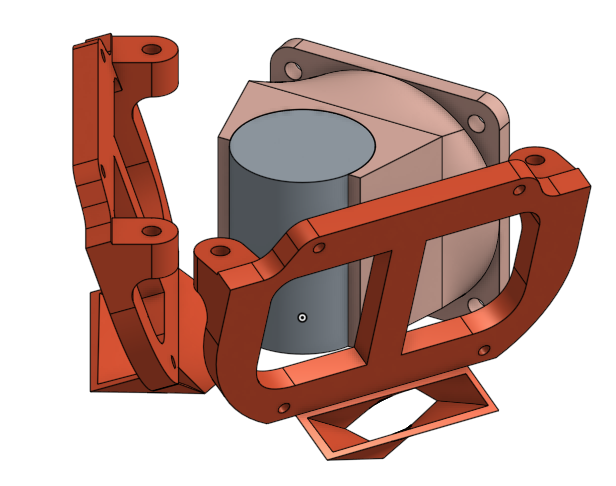 I just realized that I had uploaded the wrong fan to effector mount that was in the previous link a few posts up. It has now been changed. 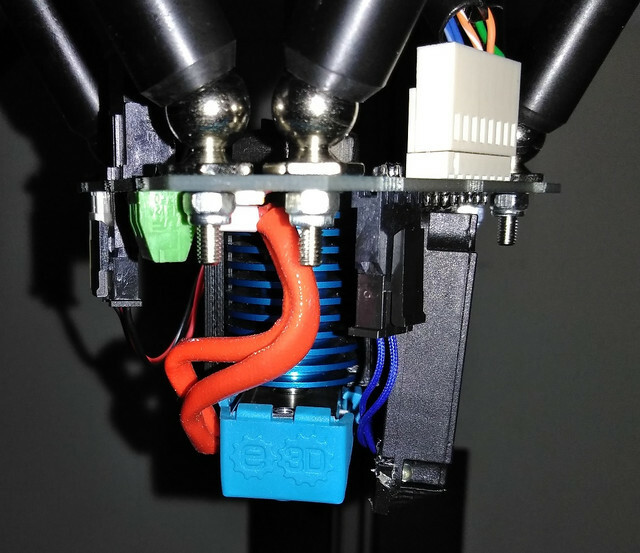 I also included a mount for the hot end fan (30mm) that drops the fan down and away 10mm. Ive bought from this seller on Aliexpress and after 40 days of no delivery doesn't want to give refund like their buyer protection, which sadly automatically closes at 40 days. EDIT: Seller did just refund after all. I did find them on ebay at the same price by searching for 24v Fan 4010S. I too have been experimenting with different blower fan mounts. I tried my design with 40x40x20mm and 45x45x10mm blower fans but these seem to be just a little too big to fit on the effector assembly and to not reduce the printing area. I just got the shipment for the Gdstime 40x40x10mm blowers and adapted my design for those. I already printed the parts but haven't yet had time to install those, so they might or might not fit I'll post more pics after i try these. I'll give it a try. Looks like a nice design. Test printing now. Had to move the ducts forward 10mm to get the air on the nozzle. Without it just blows 10mm behind the heater block. Works great and I love how it looks. Great design job. I'm reprinting now in transparent to see if it helps the LEDs reach.